Only two decades ago, it was a small electronics workshop in a warehouse. Now, it's an industry powerhouse poised to displace Sony Corp. as the world's No. 1 television maker. The growth of TCL is a homegrown success story of modern China, where manufacturers are elbowing leading Japanese electronics giants aside. Just as Sony and Panasonic once edged out top American brands, Chinese brand names like TCL, Haier, Konka and Midea are positioning themselves for a broader push into world markets. While they still sound unfamiliar to Western consumers, they've already gained a foothold in Asia. Now, they're positioning themselves for a broader push into world markets. On Tuesday, TCL International Holdings Inc. and Thomson SA, the French company that owns the American television brand RCA, announced a joint venture to produce 18 million TV sets and up to 4 million DVD players a year. Annual revenues are forecast to exceed $3.49 billion. Thomson now sells 7 million RCA televisions a year worldwide, including some under the GE brand in the United States. TCL, China's second-biggest maker of TVs and cellular phones, exports about a third of the 10 million sets it makes each year. 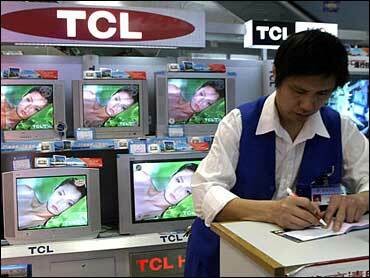 TCL was founded in 1980 in Huizhou, an electronics export base in southern China's Guangdong province. At the time, U.S. giants like RCA were beginning to shift their manufacturing to the cheap-labor operations of Mexico. But China's economics soon lured manufacturers there. According to official Chinese estimates, the average manufacturing wage is 61 cents an hour, compared with about $2.50 in Mexico and $16 in the United States. "Consumer electronics left the United States long ago, and now production is being consolidated in China," said Andy Rothman, China strategist for CLSA Emerging Markets. "There clearly is a shift to China as a major manufacturing platform for world consumption." The Chinese government is encouraging Chinese companies to expand overseas, partly to counter rising trade friction. Saturated, intensely competitive markets at home are another factor forcing manufacturers into foreign markets. At department stores like Shanghai's vast New World Emporium, TCL vies for attention with a slew of international names like Samsung and Sony - as well as domestic rivals Sichuan Changhong, which is now China's No. 1 TV manufacturer, and Konka Group Co., No. 3. While Japan's ascendance as an export power meant doom for some U.S. television manufacturers, technically advanced multinationals like Sony and Panasonic are unlikely to be done in by their Chinese competitors. Sony, struggling to keep its own television operation competitive in a market shifting to flat-panel technology, might look for a joint venture of its own in China, says David Satterwhite, managing director for Economist Conferences in Tokyo. "On the other hand, they're so advanced in other technologies that they may well cede the television sector without a fuss," he says. The TCL-Thomson deal gives the Chinese manufacturer a 67 percent stake and Thomson the rest. Televisions made by TCL-Thomson will be marketed under the TCL brand in Asia and under the Thomson and RCA brands in Europe and North America. Thomson brings to the deal its plants in Mexico, Poland and Thailand. TCL contributes its TV and DVD-related factories, research and development institutions, and 20,000 sales outlets in China, Vietnam and Germany. Foreign partners often demand a majority holding in China joint ventures to ensure a say in management. Thomson does plan to take key management posts in the $521 million venture, but the deal allows the French firm to swap its stake for shares in TCL's Hong Kong-listed unit after 18 months. That would allow it to shed loss-making factories and focus on more advanced electronics technology and services. TCL started out making magnetic tapes and telephones and now sells computers, air conditioners, washing machines, refrigerators, lithium ion batteries and broadband equipment. It didn't even enter the TV market until the early 1990s, when it began selling other companies' products under its brand. It now claims a 19 percent market share in China, and reported sales of 2.8 million sets in the third quarter of this year. While sales inside China jumped 20 percent over the same period a year earlier, TCL's overseas sales soared 240 percent. Even as TCL grows global, its roots remain evident. In a letter to employees on the company's Web site, TCL's chairman Li Dongsheng - a Communist Party member and "model laborer" - waxed patriotic when describing his company's strategy and called selling televisions around the world a "historic mission."